20110207 - Up b4 the sun and on a plane to Vegas. Got here and met up with Norm & Brian. Set the booth up and spent 5 hrs on my feet. A bit different than sitting at a desk all day. I have ran into a lot of Old friends and coworkers. Up to the roof for dinner. 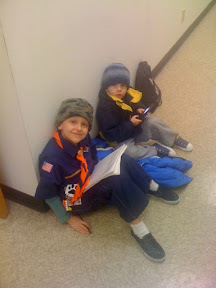 ScottS sent me a pic of my boys being good at scouts.